Below is a list of Chicago private country clubs, semi-private and public golf courses offering membership and actively seeking new members. Crane's Landing Golf Club at the Lincolnshire Marriott Resort is about creating a family; the entire family is committed to making Crane's Landing the best Golf Club and Golf Course in Illinois. The focus is about the quality of the round, the conditions of the course, and the friendliness of the staff. Everything is based on the member's experience, so experience it today and golf like a champion. For more information on Eagle Ridge Resort & Spa's Membership Program called "The Club at Eagle Ridge," go to the special Members Only page on the resort's website: www.eagleridge.com. Golf memberships include golf and cart, practice range, use of our indoor and outdoor pool, and use of the fitness center. Please email tdenklau@indianlakesresort.com for more information. 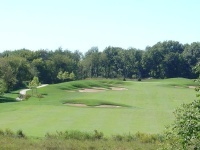 Membership includes cart fee and members are allowed to play everyday based on availability. Plan to play at least 10 times during the 2015 season at Oak Terrace? Buy the 10-Play Pass for $239! Play 10 rounds for as low as $23.90/18 Holes with Cart! Call 800-577-7598 now to purchase the 10-Play Card! We think our members are pretty great and we want you to enjoy all that Pheasant Run Resort has to offer, so we've lined up these special offers for members of the resort. 15% off food in Harvest, Jambalaya, The Clubhouse Lounge, or even at the Bourbon Street Creamery. Free Comedy Thursdays at Zanies Comedy Club St Charles! $10 Off a pair of Mainstage Theater tickets. 15% off spa services at Spa Vargas Wellness. $85 Room rate for a staycation at Pheasant Run. Refer a new member and receive a $75 Harvest gift certificate. *See the golf pro shop for complete details. **Our resort guests of corporate clients get FREE Golf Monday through Thursday with free rentals! Call 630-584-6300 and ask for sales to find out how you can set up a corporate account with us and get free golf. At Prairie Landing you can enjoy many of the amenities and the quality of a private club, on a yearly basis, without having the long-term commitment and expense of a private club. We are currently offering Annual Pass, Weekday Annual Pass, and Player Card options. Memberships available. Contact Lisa Pacioni, lpacioni@bolingbrookgolfclub.com. Crab Orchard Golf Club offers several different categories of membership. Those include Advantage Club, family, individual, associate (33 and younger), junior, and corporate. Membership includes unlimited golf, access to the Frequent Rider program, and opportunities to play in member only events. Advantage Club level membership also includes unlimited carts, club storage, range, Buyer's Club membership, and more. There are billing options available to meet everyone's budget and no clubhouse minimum required. "Golf Card Rates available with purchase of 2012 Golf Card. * Entitles Member to unlimited golf Monday through Sunday. * Individual Members will receive 3 Guest Passes**. * Entitles Member to unlimited golf Monday through Friday, No Holidays. * Entitles each Member to unlimited golf Monday through Sunday. * Couples Members will receive 4 Guest Passes**. * Personal Locker for each Member. * CDGA Handicap for each Member. * Entitles each Member to unlimited golf Monday through Friday, No Holidays. * Entitles Member to unlimited golf Monday through Friday, No Holidays, Before 3pm. * Senior is 60 years of age or older. * Entitles Member to unlimited golf Monday through Friday. * Saturday, Sunday and Holidays after 10am. * Student is an unmarried child under the age of 22 and living at home. * Student Membership includes range balls. Season Passes for Adult, Husband/Wife, Juniors, and Seniors are available. Best Valve for those who play alot. The Royal Country Clubs are private, member only clubs, offering a variety of sport and social memberships as well as affiliate privileges for their members. Beyond the impeccable golf courses, exquisite cuisine and dining, the intangibles are what complete your country club experience. The feeling of belonging each time you enter the clubhouse, the way our staff fulfills not only your requests but also your desires, the way other club Members welcome your presence, not to mention the lasting friendships that are established along the way - these are the qualities that make The Royal Country Clubs your home away from home. We would be honored to have you apply for Membership and trust that you will be proud to call The Royal Country Clubs your "home away from home!" After all, don't you deserve to become a part of Royalty? Preferred Player Loyalty Programs available to both resident and non-resident players. Membership delivers preferred access to our Tom Fazio golf course and gracious meeting facilities - ideal places to build client relationships and grow your business or simply enjoy all that golf has to offer. For more information on Membership, please call 847-832-6415.